It’s Tall Andrea’s 21st birthday today so I couldn’t resist getting her out for her first (legal) beer during lunch with me and Karen at the Kona Brew Pub. 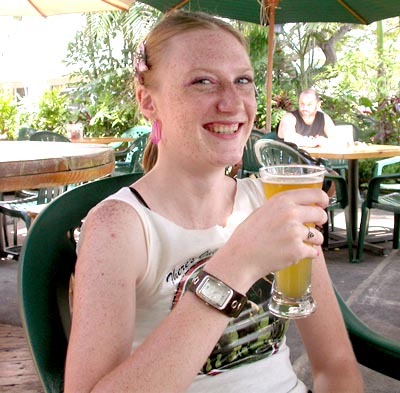 Here she is with a glass of Lilikoi Wheat Ale that they serve there. They have several brews on tap that you can’t get in bottles in stores. (Note: She has an older cousin in town that looks just like her so if you thought you saw her out before drinking it was probably the cousin and not Andrea, wink, wink.) Back to food again, a recurring topic of this blog. Lunch was Thai chicken pizza with a side Ceasar salad which was very good. 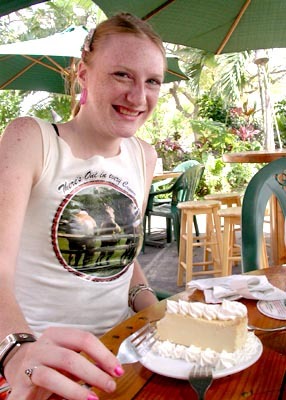 As a bonus at the Kona Brew Pub our waitress brought her a complimentary slice of cheesecake, guava flavored I believe. Pretty yummy as Andrea was nice enough to share some with Karen and myself. Tomorrow is the real B-Day celebration when we hit the Booze Cruise for all you can drink, all you can eat, all you can party fun. Don’t expect to see images from that until sometime Saturday, it’s going to be a late night tomorrow.